But they know. They caught Number One in Malaysia. Number Two in England. And Number Three in Kenya. I had never heard of this book, but I got to talking with a local book seller and we seem to let each other know of new and notable titles. She brought I Am Number Four to my attention. The book didn't come out for another 2 months, but I got online and checked out the first few chapters. The movies rights were bought by Steven Spielberg! Um...it MUST be good if the movie is being made before the book has even been published. So, I was there on release day to get my copy and see what this sci-fi book was all about. I'm not a sci-fi person. At least I didn't think I was. My mom has been urging me to give the genre a chance and that I would be surprised at what I find. 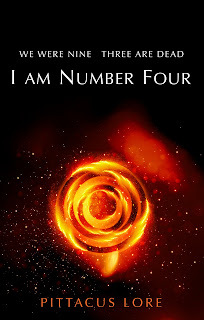 So, I thought I Am Number Four would be a perfect way to get my feet wet, and boy was I glad! It's not too sci-fi-ish (I know that's not a word, but I can't think of anything that described it better than that). It kept me interested in the characters and their quest to stay hidden. I read it quickly and felt the momentum the whole time. Really great read! I'll urge all of you to give it a try! "I am an alien, I have extraordinary powers, with more to come, and I can do things that no human would dream of, but I still look like a fool." The movie comes out Feb 2011!! How wonderful that you have a great relationship with a bookseller! I have a copy of this as well, but I haven't gotten around to it as yet. It's meant to be written by James Frey.. The concept of this book is wonderful. 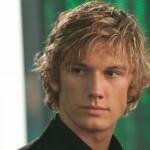 And it certainly helped that I imagined Four as Alex Pettyfer! I've been meaning to read this but I've been putting it off. I'll have to see if I can find it in my library somewhere. Looking forward to the movie too :P.
mmm sounds like a find, must put it on my to be read list! Ooooooooooooooooooo I bet I will LOVE this! My daughter just bought this and is devouring it. I'll have to borrow it. Oh yay! Got this from the library had been hearing buzz about the movie but I hadn't actually seen that many reviews of it! Looking forward to starting it!